David Jhave Johnston, Aesthetic Animism: Digital Poetry’s Ontological Implications. Hardcover | $40.00 Short | £32.95 | 288 pp. | 6 x 9 in | 1 b&w illus. | June 2016 | ISBN: 9780262034517. eBook | $28.00 Short | June 2016 | ISBN: 9780262334389. — Sol LeWitt, Paragraphs on Conceptual Art (1967). Well, it’s a long time since I have been simultaneously as delighted and dismayed as I have in reading this book. Possibly I never have, because when it is good it is very, very good, and when it is not, it is unreliable. As a survey of the field, it is richly informative. As a guide to understanding that field, it sometimes falls short. This is especially so for anyone from the broader Humanities with little knowledge of digital poetry or, most importantly, how it relates to its predecessors. It will sit on my shelf (when not in my hands) with love and exasperation, as a valued but infuriating and occasionally unreliable friend, who nevertheless is indispensable, and whom I see regularly. Let’s start with the love, since Jhave obviously writes with it, and since he also asks critics of poetry to return to it. The three distinguished blurb writers on the jacket broadly agree about the visionary strengths of Aesthetic Animism. It is a highly original and accessible contribution to the emerging histories and futurologies of digital poetry. Its author writes with an enthusiasm for language and breadth of knowledge of its manifestations in the digital field that is inspiring. The information the book offers is productive in that its extensive and varied research leads out in many directions. This includes the cross-roads between disciplines, which is a difficult place from which to write, as all of us who try it know well. This exposed and often hostile terrain is even more harsh when the authorial position is diachronic, as it is here: histories are invoked almost at every turn, as are futures. Enjoy the book for its inventive writing, its fearlessly adventurous metaphors and for its signposting of many related disciplines. Together they constitute ways of envisioning the digital Humanities at their broadest. The book is at its outstanding best when Jhave is focused on practices: at the junction between applied science and practice based Humanities; or in Jhave’s terms, at “the nexus of code and culture.” The discussion on time and timelines in Chapter 4, Softwares, is a good example, where the reader can revel in textual leaps from the goats on a 5,200 year old Iranian bowl to the zoetrope to the scrub wheel of digital editing suites (Jhave 2016, 132). Wild though this description of time-travel is, it conveys not only the tone, but also the imaginary of what is a key chapter, since it “connects the ontological proposal (of aesthetic animism) to the empirical practices of digital poets” (ibid). It does this simply and illuminatingly by exploring through specific examples how software in general can be understood – I’d go so far as to say, should be understood – as symbiotic conversations between human and machine intelligence. It goes well beyond software studies to touch on the burgeoning related fields of platform, critical code, network and “avatar/augmentation” studies, leading us into an insightful discussion of time that ties its abstractions to experiential making – no mean feat. The phrase “aesthetic animism” proves to be robust and revelatory in application, enabling subtle connections that go beyond the scope of digital poetry. Try conducting thought experiments with it in relation to conventional aesthetics, where it facilitates rethinking entrenched divisions that tend to dog attempts to displace the 18th century heritage that barks at our heels. Persistent, oppositional frameworks such as the beautiful and the sublime appear shaky indeed when brought to bear on poetry whose origins bring software of thinking machines so close to human intelligence and aesthetic appreciation as to disturb all definitional boundaries of what the human is. It would have been especially useful to have Jhave apply his key terms consistently. To take a fairly random example of a felicitous section (and Jhave encourages us to move freely and non-linearly in reading): say p.93, about Born Magazine, that ran from 1996 – 2011. It outlines the facts in some detail and comments on the magazine’s significance as a website outside the university context that commissioned and published “collaborations between published poets and professional interaction designers.” Bear with me, since the point I’m aiming for will take a moment to outline. 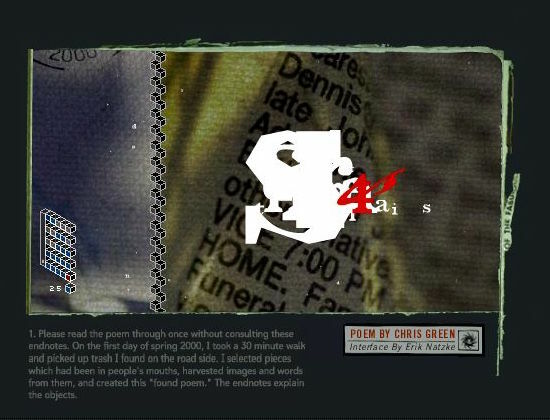 The Born website was live for 15 years. Over this time it achieved an impressive 10-30,000 visits a month. Yet, as Jhave points out, it barely features at all in the current narrative concerning digital poetry. His highly pertinent throwaway observation puts it down at least in part to “the central materiality dogma,” a genuine insight that has changed my approach to the issues. Born Magazine is full of discoveries that open up many possibilities. The word-image interactions are brilliant, and the inventiveness of the some of the interfaces revelatory. I also like very much crediting the interface designers as artists. Finally, the search engine allows searches via experience – “see, touch, hear, voice” – as well as years and other criteria, foregrounding the sensory. Jhave is right to make the case for its integration into the critical repertoire, and for reasons beyond the magazine itself. 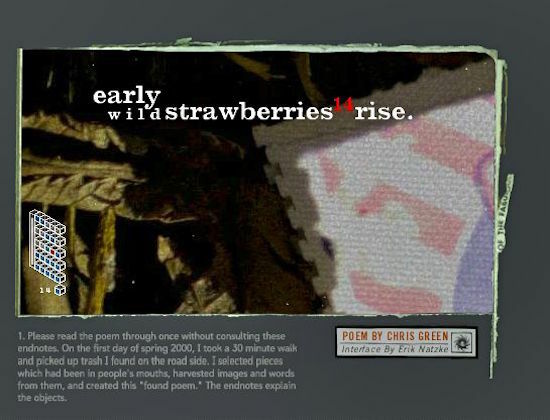 Take one of Jhave’s listed picks Walking Together What Remains (Poet Chris Green, artist Erik Natzke): the poem is a lyrical walk with multiple pathways that turn (actual) litter into visual poetry. One of these is through footnotes – an unlikely but effective poetic device. But it’s the simple brilliance of a visual interface consisting of a stack of cubes with a spine, like a book of 3-D pages that anchors the experience while rendering it non-linear. Each cube links to a page, with the front face of the page you are on shown as red. The cubes also echo a visual device on the pages. The spine, moreover, is an indicator of the time lapse between pages, and it stops when you access a note – they appear when you point at the red number. The navigation is both like and unlike turning the pages of a conventional book. 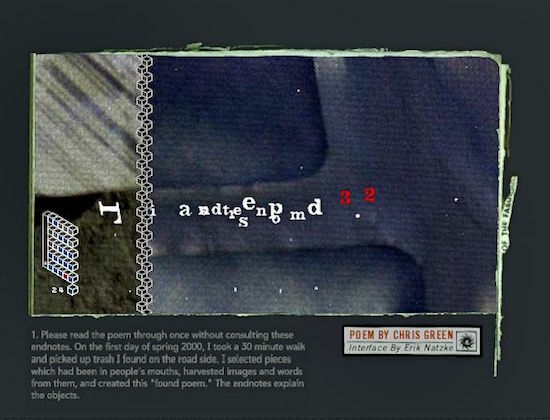 Four pages from Walking Together What Remains (Poet Chris Green, artist Erik Natzke) (2001-4), showing the static page and stages of motion. Jhave’s comments on the technicalities are admirably concise. But they could go much further in addressing the implications of the various approaches across media, and with it the much broader discussion of what constitutes the field of digital poetry. And while his hyperbolic metaphors are a great pleasure to read, they generally tell us little about either aesthetic animism or ontology. I truly do not understand why he does not take that crucial final step, connecting his terms and his points. Another example Jhave mentions,Two Blinds and a Bittern (2005 author: Michele Glazer. artist: Zoltan Lehoczki), would seem to be ideal to explain this bafflement, since its view takes us right into the possibility of experiencing the world through other creatures. Surely this is a moment leading into animism or ontology or both. The visual manifestations of the idea as surreal bird-headed men and a human eye are inseparable from the programmed syntax, affording an opportunity for discussion of the analogue and digital uses of the term that could advance the debate considerably. What we get is great enthusiasm, culminating in the claim that it is “imagination made manifest.” I felt let down by this anticlimax. The achievements of Born Magazine recede, along with the potential for digital poetry across media and platforms to expand our understanding of what poetry is. So now to the difficult bit, more about why the book is frustrating, and misses out on some of what it promises. Since Jhave to some extent asks our indulgence because he is an artist, I’m going to enlist another artist’s thoughts – Sol LeWitt’s, on Conceptual Art – to help clarify why I am so ambivalent about the book. More importantly I think its shows why these misgivings matter beyond my personal opinion. Indeed, Jhave references conceptual art at the end of a short section entitled “Poetics before Computation Era (BCE),” but briefly and dismissively (Jhave 2016, 2). 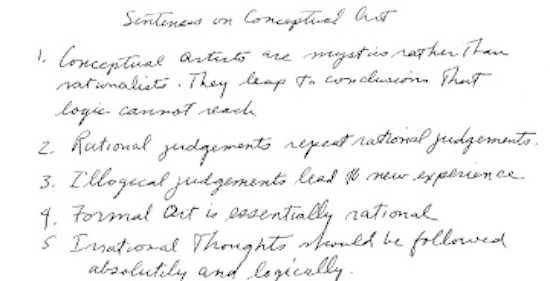 Sol LeWitt, Sentences on Conceptual Art, 1969 (excerpt). “Absolutely and logically”; the need to follow through in art as well as logic is why any concerns about inaccuracies that arise from an artist’s approach really matter. In the work of art, they can betray its integrity. In logic, they can magnify out of all proportion as time goes on. I know there are great difficulties inherent in trying to combine the broad sweep with the specialist’s deep knowledge. The route is strewn with howlers. But while the odd mis-step is relatively easily corrected, we legitimate at our peril a stance that characterizes history in what is sometimes a series of monolithic chunks, while at the same time advancing some ambitious claims. For example, the possibility that the web may be able to generate entirely new experience, only possible with AI is one thing, and I would love to read Jhave on this. But in a book about ontology and animism, to link it seamlessly with the web evolving into a creature without going deeply into what is meant is another. To give one of many possible examples of this move, there is a brief but sharp discussion of the potential role of metadata in intertextual composition. It leads fruitfully into the section “From Spimes to Spoems” (Jhave 2016, 12-13). Bruce Sterling’s 2005 term spimes – “evolving mediated networks-of-things that intercommunicate” – leads further into Jhave’s neologism, “spoems,” forms made possible by the growth of the web through collective contributions. This opens on to the exciting potential of a new kind of artifact, new understandings of collective authorship and “being.” But a creature? It would be valuable to have Jhave’s imagination applied to suggesting where his apposite reference to Jichen Zhu’s work in the following quote might take the discussion of ontology: “it may be possible to generate an experience that is only possible with AI.” Yes, this is really full of potential; but standing alone, it hangs, mid-air. Zhu’s work is more mindful of the gap between this and seeing the net itself as animate, exploring, as she does, the interrelations between the social and the technological. Jhave makes no attempt to bridge or explain this, here or, I think, anywhere else in the book. Coming at it from the other end, as it were, from starting with “wet” life, it puts me in mind of some kinds of Bioart, where unproven claims are made for the artefacts as new life forms, whereas many are only spectacle or illusion. Such material can detract from the really interesting work. I’m as intrigued as anyone else by the possibilities, but I’m yet to be convinced by too much out there. This kind of logical conundrum arises perhaps from the book’s aim to bring back the heart, where heart is opposed to intellect or “abstract cognition”: Jhave says that “[…] in literary criticism the heart sometimes gets left behind” (Jhave 2016, 8). It’s an old issue, and while what he says is surely true sometimes, it takes no account of the ferment of debates in the second half of the 20th century that fractured and interrogated and rendered the field unrecognizable from that of the first half of the same century. Of course, the book is not about this. But Jhave’s praise for Born Magazine rests explicitly on bringing together serious critical analysis and sensuous appreciation. Isn’t this what Derrida brilliantly does in his moving work Memoirs of the Blind (1993)? Is Derrida’s work critiquing essentialist ontology really irrelevant here? Judith Butler’s? Levinas…and others? Approaches to reading and the fields of L/literature were passionately and extensively re-examined and re-invented at the end of the 20th century – from New Criticism to Structuralism, through Marxism, Psychoanalysis (Freudian, Lacanian, Kleinian inter alia), Deconstruction, Relationism, Postmodernism, social critiques such as Bourdieu’s, not to mention contested variants of Feminism and Postcolonialism or Orientalism. And even this is far from exhaustive. It’s perfectly true that the era of high theory led to some terrible writing and obscured the sensuousness without which art is nothing. I don’t want these thoughts to seem like those of an apologist for it. Nor do I want to see its return. But to try and dissociate the critique of digital poetry from a homogenized LitCrit is to set up a straw man in place of a host of highly developed flesh and blood women and men, fully capable of contributing to the nascent field of digital poetics. The digital era is much too complex and networked for what can look like a kind of diffuse Romanticism, and with it a desire for revolution. Writing is far too embroiled in radical change for us to be able to “turn things upside down.” We are lumbered with perhaps too much of our past histories, but we can’t just ignore them. Yet even so, and possibly in spite of himself, Aesthetic Animism shows Jhave to remain more comparable to LeWitt in many respects than he is to this admittedly severe portrayal. They are more similar to each other, for example, than either is to early Modernism. This is because they are both sensuous thinkers. In LeWitt’s terms, Jhave’s book unfolds as a brilliant concept, but uneven in its ideas. By this I don’t straightforwardly mean that some ideas are good and some are bad; I mean that the ideas sometimes do not do justice to the concept. This is, in the main, because, as I demonstrated above, they stop short or fail to link up. Even though the ideas that go off at a tangent are hugely valuable, they would be more so if they had been interrogated and/or elaborated more closely. The short section “Language: What is it?” is a case in point. It ends by characterizing a change (over an unspecified time, but implicitly perhaps the 20th century to the present) in “the ontological status of language from abstraction to entity to ecological force” (Jhave 2016, 10-11). Linguistics is dealt with in eleven words plus a short re-quote from Saussure and most everyone else is passed over. The problem is that the ontological status of language is right at the core (I nearly said “heart”) of this book and right at the core of the philosophical re-invention that coincides with the birth of digital poetry. The risk is that the book is potentially masking ways in which we can reconfigure some of these debates in order to enhance understanding of his project – and nothing I have said fundamentally devalues the project in its essence. To say that digital media offer “a chance again for words to live as if born from the breath of ‘gods,’ but this time on the waves of networks, in the minds of algorithms” does not lead anywhere, and, more seriously, can be read as linking with what on the wider contemporary scene merges reason with belief. Descartes’ divorce of mind from body was bad enough, but “credo, ergo sum” would be out of the frying pan into the fire. I don’t at all think this is where Jhave wants to take us. One of the reasons LeWitt is so useful as a comparator is that, while what he says is relevant to a great deal of what I think Jhave is articulating, LeWitt does not reference the heart. He undertakes a new kind of thinking. It’s integrated, whole body thinking. This matters because the heart is notoriously misleading. Blind Love – once a common poetic trope – has led many a poetic figure on a merry dance. LeWitt is also of the era of Kristeva, who is invoked in support of Jhave’s argument in what begins as a useful reference to her notion of the “chora.” But when it comes to following through on what she says, he slides past a crucial part of the quotation: it is not yet a position, a sign or a signifier,“it is, however, generated in order to attain this signifying position.” Jhave chooses to follow only her ideas pertaining to the semiotic, not those of the symbolic. The rest of this section is muddled. Digital Poetry is not now in the position of sculpture in the 1970s, as suggested (Jhave 2016 48, 166). Handled differently, it could have been a great comparison. Krauss’s notion of the expanded field is indeed a productive way in to rethinking the ways out of the strictures of Enlightenment Reason, of reuniting head, heart and prosthetic body. Language artists and “fine” artists have been articulating new kinds of embodied and embedded thinking since the end of the 19th century. The numerous standard bearers, some of whom only are mentioned above, and many others, have already shown at least part of the way. Jhave is equipped to take this into the future. But this text repeatedly approaches some vital discussions around embodiment and language, only to veer off into organic metaphors and fictive histories. I am pointing to a risk as we reconsider reason and ontology in light of AI – in “the expanded field,” if you like. Ontology has a contested history as briefly indicated above not least because ontology in philosophy is a rather different beast from ontology in computer science. In metaphysics, it concerns being, while in IT it’s more about categorizing relations between entities in a given system. Aesthetic Animism seems to me to inhabit a space between them, and I think Jhave would agree. It could have usefully sojourned there a little longer to discuss its implications more clearly. One of the losses entailed is that possibly exhausted terminologies are left hanging. In terms of my own thinking, this text in part seems really usefully to suggest that the psychoanalytic freight that comes with many of my critical terms might be turning into an obstacle. One of my frequently used such words is “subjectivity.” I now want to question whether it has outlived its usefulness in the context of digital poetry. It is awkward when in comes to defining or critiquing the complexities of the digital writing “Subject” across poetry that through interactivity or code invokes at least three “subjects” in reading. It would have been excellent to have this kind of issue taken much further, even if not fully resolved. The ambition of the title takes it on. There is a great deal more to be said, both about the good things and the less successful aspects of this book. I will leave it there, however, and close with a pointer towards continuity rather than rupture. I actually think I can agree with far more of Jhave’s thought than I suspect he will think he can of mine. It’s a conversation to be had, perhaps. The aim of outlining a “poetics appropriate to the digital era” is admirable. But I don’t know what “traditional poetry” means in this context. If it just that which is concerned with “being” I can only say that poetry throughout the ages has not always been concerned with being. This could only mean that tradition is being equaled to the Modern period, which was a time of intense ferment and innovation. So while enjoying the conceit of poetics BCE (before computation era), I would quarrel fiercely with it as it is outlined here. This is true. 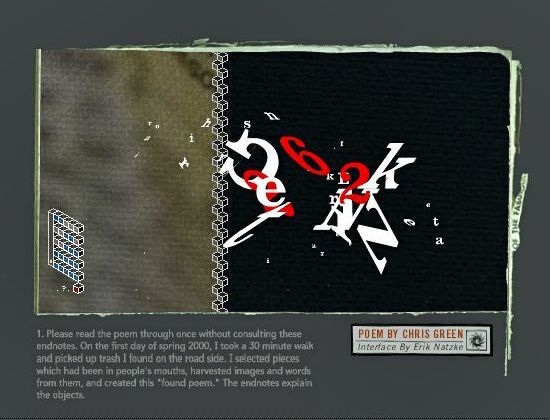 Digital poetry is not simply a descendant of the book. But it is complexly a descendant of the book. And it has the power, like all knowledge technologies, to revise its ancestor, to expand what the book is. I hope that Jhave will write in more detail on what this means. In practice. Now then, how to end? I’ll borrow from a poet who holds a secure place in tradition, and who was writing just before the invention of the only technology to compare with the digital: that of the printed book. (Roughly: Go, little book, go, my little tragedy…but pay your dues to the whole of poesie). Derrida, Jacques (1993): Memoirs of the Blind, Chicago, Chicago University Press. LeWitt, Sol (May 1969). New York: 0-9; London: Art-Language. The section on how to read the book is no help and should have been edited out. It stopped me in my tracks. My advice to the reader would be to read at random, following whatever catches your eye. I’m calling David Jhave Johnston “Jhave,” since that’s how he’s generally known, and how he’s listed in the wide-ranging bibliography. Johanna Drucker, Charles Bernstein and Christian Bök. The reference is to literary critics having absorbed the terminology and analytic methods of Conceptual Art, so I’m pretty sure Jhave would not recognize the conceptual artist in himself. I emphasize that I’m not claiming they are saying the same. It’s not about merging them, but about using one to illuminate the other. There is, of course a great deal more to be said about the term “ontology” outside the digital field, but that is not to imply that its use is uncontroversial within it. It’s often referred to as “an ontology” in these debates; I don’t recall ever seeing this usage in philosophy, but I haven’t researched this. The main issue, if it’s not to labor the point, is the lost opportunity to make a real intervention in these debates within the digital field/s. The book covers the period 1994-2014, but it refers to much that falls outside this 20 year bracket. Geoffrey Chaucer, Troilus & Criseyde, Book V. c1385. Penny Florence is Professor Emerita at The Slade School of Fine Art, University College London, UK. Previous jobs include Chair of Humanities and Design Sciences, Art Center, Pasadena, USA; Head of Research Programmes at The Slade; Professor of Contemporary Arts & Director of Research at Falmouth University, UK. Her publications include a number of books and articles on issues related to art, poetry and cultural theory, including the digital and its prehistory. The French poet Stéphane Mallarmé is a sustained interest, as are feminism, innovation and experimentalism. She has exhibited a number of art works, films and published poetry. Public performances/exhibitions of digital poetry include Tate Modern (London, UK, 2006, 2007, 2008); ELO 2010 (Providence RI, USA—seeded speaker); Making Sense 2010 (Paris, France); e-poetry 2011 (Buffalo, NY, USA); ELO, Tate Britain 2013 (London, UK); ELO 2015 (Bergen, Norway); Newlyn Art Gallery (Cornwall, UK, 2016), The Plough, (Devon, UK, 2016), July 2016.